This is a fast paced action story with a lot of election politics. I didn't like it as much as I wanted to because at some places the world view is too provincially Western; the thing that irritated me most was a small passage on the classification of world's languages - confidently told & totally bogus. Here is a solar Empire spanning many worlds, dominated by humans though there are aliens on other worlds. It's a monarchy similar to British one - emperor is supreme but is a rubberstamp, & sits in a city on the moon. The parliament has the power & is elected; aliens can vote but must choose a human representative. Head of government is the "Supreme Minister", probably majority leader in Parliament. Current ruling party has arranged the kidnapping of the leader of opposition at a time where he's absolutely required to be present at a Martian ceremony. So his underlings will recruit an actor, Lawrence Smith aka Lorenzo Smythe, to act as an imposter at the function. One thing will lead to another & new situations will keep coming up & the imposter will end up becoming the politician he's impersonating. The story is, first & foremost, the character study of this actor, & evolution of his personality. First published: Astounding, Feb/Mar/Apr 1956. 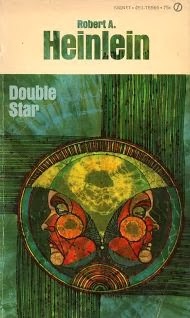 Winner of Hugo Award 1957 in novel category. Related: Stories of Robert Heinlein.